And so when there is an opportunity to meet up, it is always a pleasure. And when the other collector is a connoisseur and a Guru, pleasure turns into awe and delight! 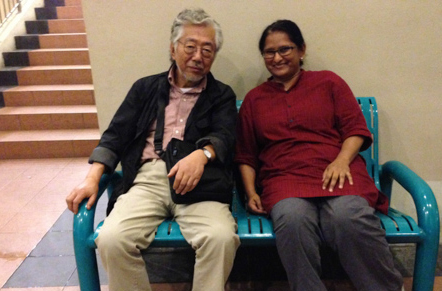 Mr. Tadashi Morita and I were introduced by a common friend and we had talked on the phone a few times. A fortnight ago he called to say that he had planned a day trip to Singapore only to meet me and see my collection. I was delighted! I knew that he had written books on textiles and is highly respected in his field! But I learnt just yesterday that he stepped into the gorgeous world of textiles forty five years ago! Forty five!! I had not even learnt to say the word at that time! Excited and well prepared, we began our day at 9.30am. The day slipped by, chatting, showing, viewing the textiles and discussing the stories behind them. We sat on the floor and without any pretentions made the textiles the focus of all our attention. We could have done the viewing in the car park or in an open desert or in a 5-star hotel and the environment would not have mattered to him. Knowledgeable and humble – his purist outlook inspired my deepest respect! I hope that yesterday will mark the beginning of a long friendship! Unfortunately it may be awhile before he embraces the internet that has allowed the tiny fragmented world of textile-lovers to come together and collectively dote on the common objects of their passion. This entry was posted on February 14, 2014 by wovensouls in Art Kaleidoscope, People Kaleidoscope and tagged art, author, collectible, collection, hobby, japan, Japanese, passion, Singapore, textile antiques, textile art, textile colector, textile dealer, textile lover, traditional textiles.